Members who have been furloughed should be aware that their health care coverage benefits from their employer extends through the end of the fourth month after being furloughed. Below are Frequently Asked Questions that may be useful to our furloughed members. Q: How long does my insurance coverage last if I am furloughed? A: Employee and eligible dependent coverage extends through the end of the fourth month following the month in which you last render compensated service. For example, an employee last rendering compensated service in January, who is then furloughed in February, will have coverage extended through the end of May. Q: Will vacation pay extend coverage beyond four months? A: With regard to furlough – no. Q: Will I be able to continue coverage under COBRA when coverage for me and/or my dependents end? A: The COBRA eligibility period (18, 29 or 36 months) is measured from the date of the “qualifying event.” For the health and welfare plans, the “qualifying event” is the date you last worked, NOT the date your coverage ends. The COBRA eligibility period, therefore, runs concurrently with the extended coverage as state above so that COBRA continuation is available for the remaining months, if any, after the extended coverage ends. For example – An employee is furloughed in January and coverage extends through May. COBRA continuation is available beginning June 1 and thereafter for an additional 13 months. In these circumstances, no more than 18 months of COBRA is available, less the five months during which the employee remained covered by the Plan after the qualifying event in January. Q: How will I be notified that COBRA is available to me and/or my dependents? 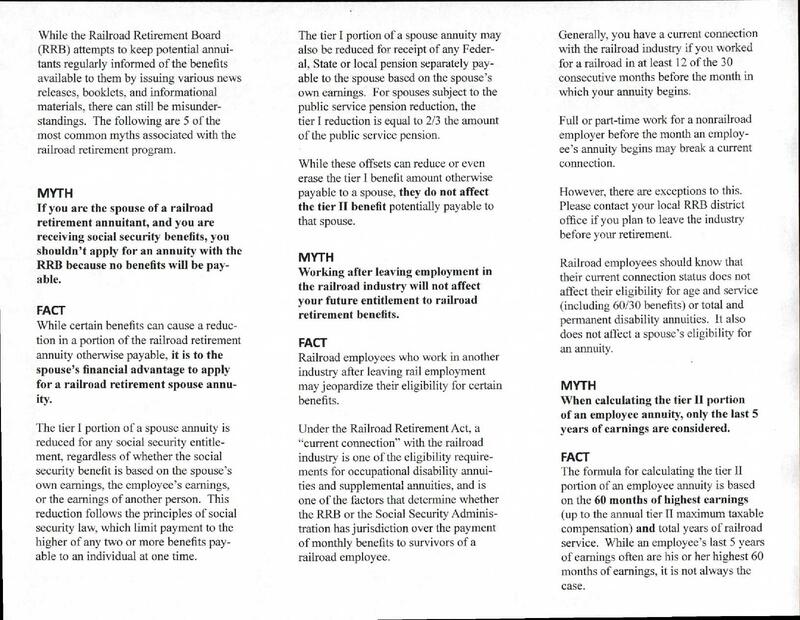 A: When the railroad reports an employee as not being eligible for benefits, a COBRA notice is automatically sent to the employee’s address of record. The form must be completed and returned to UnitedHealthcare in a timely manner in order to establish COBRA coverage. SMART TD AND BLET: CALL CONGRESS for 2-PERSON CREW, NOW! 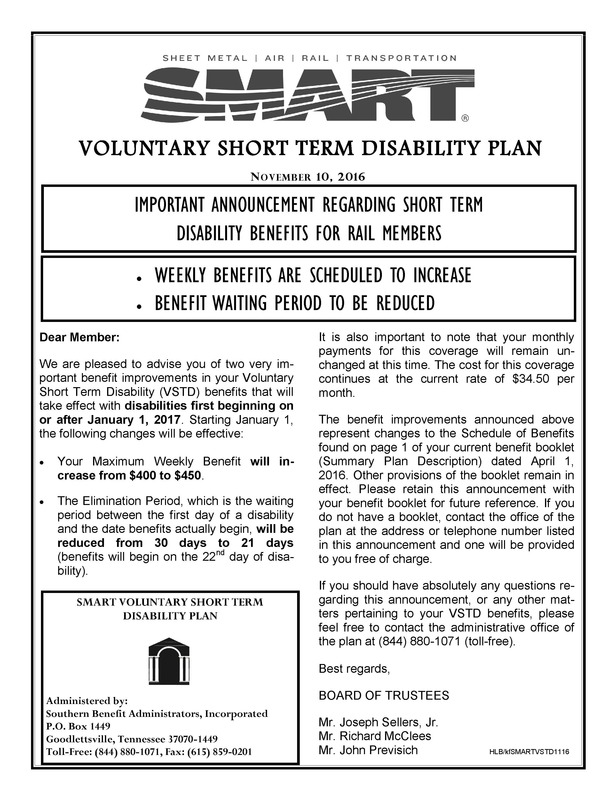 CLEVELAND, Jan. 20—The Brotherhood of Locomotive Engineers and Trainmen (BLET) and the Transportation Division of the International Association of Sheet Metal, Rail Air and Transportation Workers (SMART TD) are urging their respective memberships to contact members of the House of Representatives about co-sponsoring The Safe Freight Act of 2017 (H.R. 233), a bill that would mandate two-person train crews on freight trains—one certified locomotive engineer and one certified conductor. The current two-person crew bill mirrors legislation that was introduced in the 114th Congress, which garnered 69 co-sponsors in the House of Representatives. Now is the time to speak up and voice your support for two-person train crews! All active and retired members of the BLET and SMART TD, as well as their Auxiliary Representatives, should contact their House Representatives and ask them to Co-Sponsor H.R. 233, the Safe Freight Act of 2017. SMART TD and BLET members: Please visit the SMART TD Legislative Action Center (LAC) where you can easily find and contact your representative and urge him or her to support H.R. 233. Click here to visit the LAC and let your voice be heard! Members can also call the U.S. Capitol Switchboard at 202-224-3121, and ask to speak with the House of Representative member from your Congressional District. Contact information can also be found online at: http://www.house.gov/htbin/findrep. Earlier this month, the BLET secured a significant victory for rail workers from the highest court in the United States to protect two-person train crews. 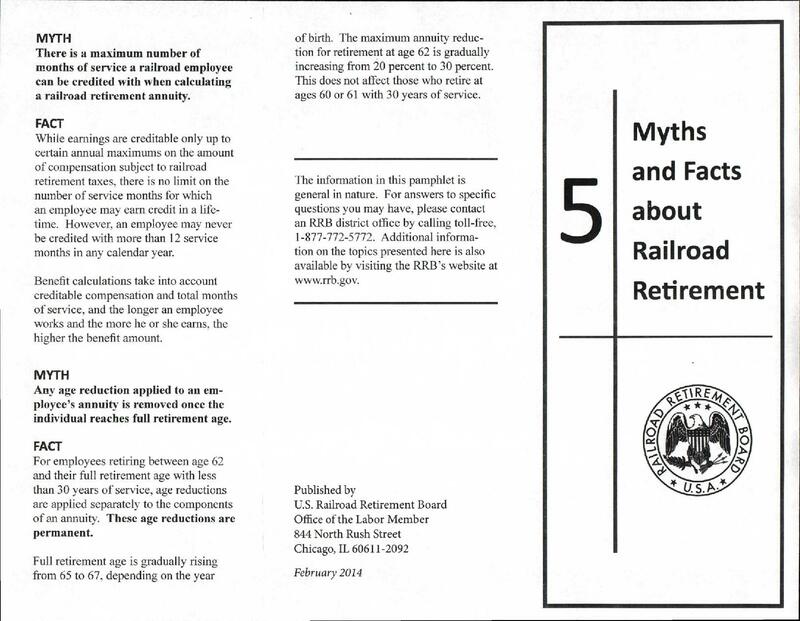 On January 9, the United States Supreme Court denied a petition filed by the Wheeling and Lake Erie Railway asking that the nation’s highest court review and set aside the 2015 finding by the Sixth Circuit Court of Appeals that the railroad’s use of managers in place of union conductors was a major dispute under the Railway Labor Act. The issue of two-person train crews has been in the national spotlight since the July 6, 2013, derailment of a Montreal, Maine & Atlantic (MM&A) oil train in Lac-Megantic, Quebec, which killed 47 people and destroyed the center of the town. The MM&A train was crewed by a single person. Since that time, there has also been movement by major freight railroads to seek collective bargaining agreements to allow for widespread use of one-person train operations. SMART TD and BLET have lobbied to protect two-person crews as being paramount to safety. “We will continue our tireless and years-long work of supporting a minimum of two crew members on all trains. An overwhelming majority of Americans from both political parties support this measure: the American people have spoken and are in favor of this bill. It is past time for our government to get on track, do the right thing and support H.R. 233. This measure is a matter of domestic safety and security for railroad workers, passengers, our cities, towns and our entire nation,” said SMART TD President John Previsich. President Pierce and President Previsich both thanked Congressman Young for introducing the bill. The Brotherhood of Locomotive Engineers and Trainmen represents nearly 57,000 professional locomotive engineers and trainmen throughout the United States. The BLET is the founding member of the Rail Conference, International Brotherhood of Teamsters. The SMART Transportation Division (SMART TD) is headquartered in the Cleveland suburb of North Olmsted, Ohio. It is a broad-based, transportation labor union representing more than 125,000 active and retired railroad, bus, mass transit and airline workers in the United States. It is a division of the International Association of Sheet Metal, Air, Rail and Transportation Workers based in Washington, D.C.
DENVER – An investigation by the U.S. Department of Labor’s Occupational Safety and Health Administration (OSHA) has found that BNSF Railway Company violated federal law when it terminated a track inspector for insubordination after the employee reported railroad track defects to management. OSHA has ordered BNSF to pay more than $147,000 in back wages and damages and take other corrective actions. Agency investigators determined the company retaliated against the former employee in violation of the Federal Railroad Safety Act. A Berkshire Hathaway company, BNSF is an international railroad operator headquartered in Fort Worth, Texas. It employs more than 42,000 employees. The company and the former employee may file objections or request a hearing, within 30 days of receipt of the agency’s order, before the department’s Office of Administrative Law Judges. OSHA enforces the whistleblower provisions of the CPSIA and 21 other statutes protecting employees who report violations of various airline, consumer product, environmental, financial reform, food safety, health care reform, nuclear, pipeline, public transportation agency, railroad, maritime and securities laws. Employees who believe that they have been retaliated against for engaging in protected conduct may file a complaint with the secretary of labor. More information is available online at http://www.whistleblowers.gov/index.html.